Bewundern Sie Baron Haussmanns Paris und besuchen Sie bei diesem privaten 2-stündigen Rundgang zwei der prächtigsten Gebäude der Stadt. 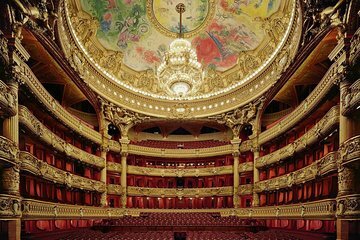 Erkunden Sie zunächst das opulente Palais Garnier, eine Vision aus schillernden Marmor- und Kristallleuchtern, mit seinem Grand Staircase und dem berühmten Auditorium. Bummeln Sie anschließend in den eleganten Läden von Galeries Lafayette, dem berühmtesten Kaufhaus von Paris, bevor Sie auf das Dach gehen und die spektakuläre Aussicht auf die Stadt genießen. I could not find my guide even though I was there early and walked around and around for almost in hour looking for her. I called twice and got an answerering machine. I went on in and bought a ticket to take my own tour. As I waited, she called and said Where are you? She came on in and was going to take me on the tour. Then there was trouble with the tickets. The Opera gave her the wrong tickets and we had to go back and straighten all of that out. Finally we got in and bottom line is that the 2 hour tour of the Opera and Galeries Lafayette turned into an hour for both of them. We rushed through the Opera and then she walked me over and into the Galeries Lafayette, took me to the perfume counter that I asked for, and left me there as her time was up. The guide was, however, very knowledgeable and fun to be with once we got together. I think the problem was that she might have been there in the crowd, but as I looked and looked, I did not see anyone who appeared to be a guide and apparently she did not see me walking aorund and around looking at everyone. The badge, as it turned out, was hanging around her neck, but not very obvious. I paid for 2 tickets, but it turned out to be just me. If there had been more people with questions, It would not have worked. I suggest. More obvious badge. This tour was magnificent; a highlight of the trip. Our guide, Claudia was amazing, a trained architect, local historian and showed, told and informed us very well. Great personal tour!